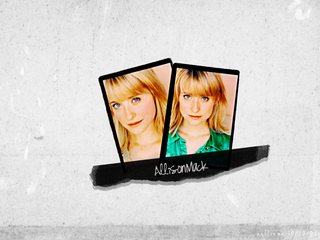 Fan Forum > TV Shows - Past > Smallville > Allison Mack/Chloe Sullivan #20: B/C soon, she will have director on her resume! Yay for Allison on the cover! Not much for Chloe to do in this week's episode. I did like how she saw through Lana's lies. And I take it she was checking out that meteor infected help place for herself? Cris, I agree, Chloe was there checking the place out for herself and immediately went into "stealth" mode when she found out Lana was the charitable force behind it. I'm so glad she called Lana out on her lie, and it's going to be in no time, before she finds out the truth. Can't wait for that confrontation So Allison did good, even in a limited role. That look at the end, when she asked Jimmy to lunch, and he had already said yes to Kara, was kind of heartbreaking. AM has the most expressive eyes, and you can't help but feel for Chloe. Does anyone know how to make art small enough to fit the opening post, please? I just watched "Zod" this morning, and Chloe did it again. Clark was coming over to conront her about the kiss, and she said she "laid one on him" and that she's not expecting them to "hook-up". So, in turn she was insecure to confront her true feelings, and as a result let Clark off the hook. Meanwhile, Clark wasn't ready to say "what we did was a spur of the moment thing." So, it makes sense that Chloe would just break it off with Jimmy because of that. I hadn't thought about it. I hope she gets to. Which episode is Allison meant to be directing? the 20th. so if they're forced to cut down the season due to the strike, she might not get the chance. i loved her her hair was in season 5 and the beginning of season 6, but then she changed it halfway through the season and i hated that hairstyle she had. i'm glad it's changing for season 7 now! And oops nearly at the end of the thread now! Does anyone have a new title suggestion? Because she's the Daily Planet's Ace Reporter!